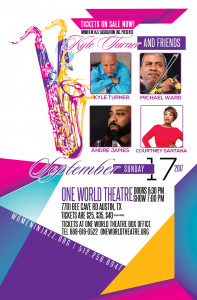 Kyle Turner & Friends featuring Kyle Turner, Michael Ward, Courtney Santana, Andre James – Women In Jazz Association, Inc. 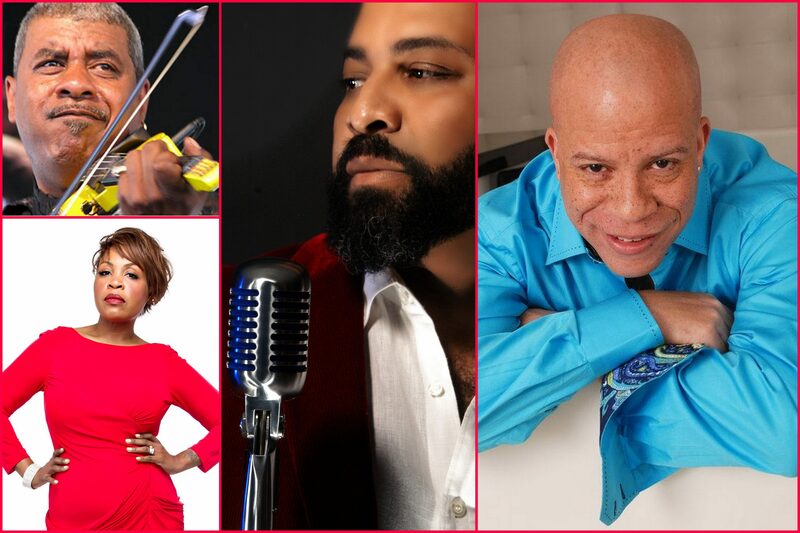 This combination of saxophone from Kyle Turner, Michael Ward on the violin, singers James Andre and Courtney Santana is the perfect mix for a dynamic evening of smooth jazz, blues and a little old school R&B. Get ready to shout for more! Kyle Turner is a creative and innovative artist that has warmed the hearts of many with the sultry musical notes birthed from his instrument, the saxophone! Kyle’s musical career has provided him the opportunity to share the stage with such artist as Luther Vandross, Johnny Taylor, Bobby Lyle, Joe Sample, Kirk Whalum, Regina Belle, Al Jarreau, and Michael Henderson just to name a few. He has been extremely active as a music educator and lecturer in the Houston Independent School District and as an artist in Residence at Texas Southern University. As a result of his success in music performance and music education, Kyle was honored in the 2008 and 2010 editions of “Who’s Who in Black Houston”. Look for his new CD soon. Michael Ward is one of the few instrumental musicians who have chosen to play jazz on violin. He has performed with some of the world’s top entertainers throughout his career including Wynton Marsalis, Lionel Hampton, Ronnie Laws, Al Hirt, Najee and Kirk Whalum to name a few. He has been documented on more than fifty different recordings covering several styles from Jazz to Blues, Country and Zydeco, Cajun, Pop and Hip Hop. All three releases, “Just Me,” “Laid Back” and “Make a Wish”. were featured in Downbeat and Jazz Times magazines. Michael Ward has five CDs to his credit and over 100 recordings with various artists ranging in diverse styles of music. His smooth deliverance and stage presence will knock you off your feet awaiting another breathtaking performance. Vocalist and recording artist Courtney Santana has been in music, live music theater, and dance for over 30 years. She has been a featured vocalist and background vocalist on over 17 albums and she has performed with and alongside Brannen Temple, Guy Forsyth, Patrice Pike, Strings Attached, Malford Milligan, Nakia, Chanel Haynes, and more. She has also opened for national acts like Kirk Whalum, Kyle Turner, Salt N Pepa, and Musiq Soulchild. In 2017 she will release her single Survive and a full length album in Spring of 2018. She has been nominated by the Austin Chronicle for best cover band for 3 times. As a member of Austin’s theater community, she has performed in some of Austin’s most loved musical performances including Dreamgirls, Fame, Porgy & Bess, and RENT and in May of 2012, she was honored to be the cover of Austin Women’s Magazine for her work as a vocalist and as a leader in the domestic violence movement. In 2017, she received a proclamation from Mayor Steve Adler, proclaiming March 3 is Courtney Santana Day in Austin, Texas. Thank you for helping Women in Jazz make this happen!